Seventeen year old Lozen’s life has never been exactly easy. Her family was never among those who could afford genetic modifications or the latest tech implants. But once upon a time they had their own home, and pets, and her father and uncle were still alive. Now it’s just Lozen, her younger siblings, and their mother – and all four of them are trapped behind prison walls that exist to keep monsters out and them in. Lozen knows how to hunt the monsters though – that’s why The Ones in charge have let her and her family live. It’s also why they hold her family hostage, ensuring her compliance. Lozen knows that if she can just manage to get them all outside of Haven’s walls and out of sight of the guards, they’ll be able to once again survive and live on the land that her people have called home for centuries. I really wanted to love this book. She’s a monster hunter, for goodness sake! (Plus, how many dystopias are out there that feature Native American characters?) And for the first third or so, I did love it. 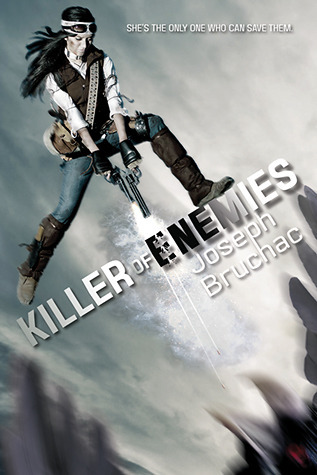 But the pacing grew increasingly uneven, our introduction of each succeeding villain became too repetitive, and one of the twists just didn’t quite work for me. Still, it’s a good book, with some very excellent lines and scenes, and think it should be in every library’s young adult collection. Sophronia does an excellent job of getting herself into trouble and embarrassing her older sisters, but she is perpetually floundering, stumbling, and tripping when it comes to being a proper young lady. Fortunately (for her mother’s nerves, if nothing else) Mademoiselle Geraldine’s Finishing Academy for Young Ladies of Quality is willing to take Sophronia in. 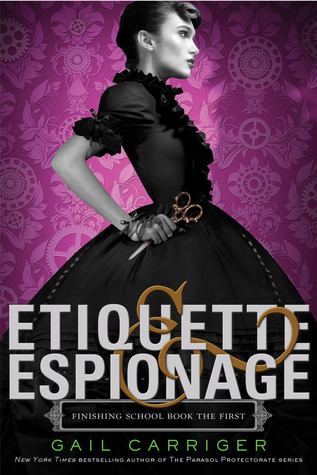 Gail Carriger’s Finishing School books are set in the same alternate steampunk universe as her Parasol Protectorate series, so of course Mademoiselle Geraldine’s Finishing Academy is not quite what Sophronia expected, and her lessons include much more than how to curtsey properly. Yet, it’s full purpose, and her reason for being there, remain a mystery to her long after she climbs on board (yes, on board), creating a useful narrative trick for controlling the pace and for keeping readers guessing – and turning the pages. It’s the kind of story that would likely come across as a bit overdone and over the top if it were written by someone else, but Carriger manages to carry it off with style. Unfortunately, there is a rather large misstep about a third of the way through the book, when the only character of color is introduced in a way that isn’t at all logical or appropriate. While this same character is shown in an admirable light for the rest of the book, that doesn’t excuse the author and editor leaving in a description that makes no sense and is based on caricatures. Which is a shame, because the rest of the book is delightful. It tweaks it’s nose at gender conformity, flirts a bit with critiques of class and inequality, and isn’t afraid to show complex relationships among female personages.